Product prices and availability are accurate as of 2019-04-24 19:11:16 EDT and are subject to change. Any price and availability information displayed on http://www.amazon.com/ at the time of purchase will apply to the purchase of this product. Please refer to listing for planting instructions, item does not come with instructions. The Sweet Banana Pepper is a light yellow to red pepper, averaging 6 1/2" x 1 1/2", with a good, sweet flavor. An early producer, and widely adapted. Dates back to WWII era. Sow seeds indoors, 1/4 inch deep in flats, peat pots or cellpacks, 8-10 weeks before you anticipate transplanting outside. Seed germinates best when soil temperature is 80 F or higher. It will not germinate below 55 F. Keep plants indoors in a warm (70 F during the day, 65 F at night), sunny location. Lack of light will produce leggy, unproductive transplants. Don't be in a rush to transplant outside. Cold temperatures can weaken plants and they may never fully recover. A few days at 60 F to 65 F with reduced water will help harden plants and reduce transplant shock. Over-hardened plants grow slowly after transplanting. Set plants out 2 to 3 weeks after average last frost when the soil has warmed and the weather has settled. Plant them 12 to 24 inches apart, in rows 24 to 36 inches apart, or spaced about 14 to 16 inches apart in raised beds. Use black plastic and/or row covers to speed soil warming and early growth. Use caution with row covers not to overheat plants and cause them to drop their blossoms. If not using black plastic, mulch plants after they are well established and the soil has warmed to retain moisture and control weeds. Peppers can be temperamental when it comes to setting fruit if temperatures are too hot or too cool. Nighttime temperatures below 60 F or above 75 F can reduce fruit set. Too much nitrogen fertilizer may promote lush vegetative growth but fewer fruits. 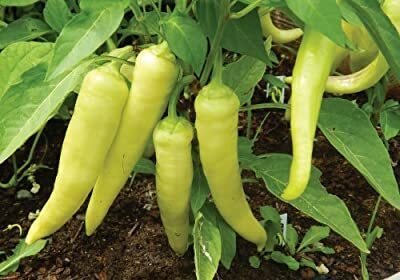 Peppers usually responds well to phosphorus fertilizer. Peppers need even moisture for best performance. An even supply can reduce blossom end rot, a disorder caused by lack of calcium.